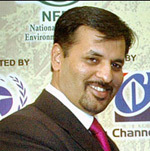 1 July 2009: The facebook fan page of Karachi’s Mayor (Nazim) Syed Mustafa Kamal describes him as the “true working class representative of Pakistan”. Western-educated but passionate about his city, Karachi’s first citizen uses his considerable online presence and following to keep in touch with the residents of Pakistan’s principal urban centre and financial hub. A leading member of MQM (United National Movement), Pakistan’s largest centre-left party, he is credited with his attempts to turn the city into the next Dubai, while continuing to speak up for its sizeable underclass. Mayor Kamal was shortlisted for the 2010 World Mayor Prize. 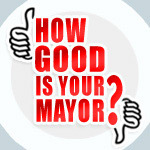 Kamal’s facebook site is regularly updated with the minutiae of city administration which most mayors would leave for official minutes, speaking proudly of urban developments in the pipeline and city pride initiatives. The Karachi city chief’s achievements in office were singled out by the magazine Foreign Policy in 2008, though his over-zealous supporters in Pakistan were later criticised for their misrepresentation of the accolade by dubbing him the “second best mayor in the world”. Born in 1971, Kamal was first educated in the city before achieving an associate’s diploma in business while studying in Malaysia. He later received an MBA while studying at a British university in Wales. Kamal claims that his upbringing, though comparatively middle class, has enabled him to remain conscious of the city’s primary needs, particularly around sanitation and street management. Kamal is supported in his task by his naib (deputy) Nasreen Jalil, a former senator who hails from a family of notable members of the country’s governing classes, being educated in Paris and London. Prior to his election as nazim in 2005, Kamal served as minister for information technology in the state government of Sindh (2003-2005), where he received acclaim for his programmes to increase access to jobs in telecommunications among the more illiterate and underclass members of Pakistani society. In doing so, he insisted that ICT courses become mandatory during the compulsory stage of state education while seeking to close down disreputable colleges offering bogus courses. Karachi’s civic ambassador has continued to champion the role of IT in transforming the city’s fortunes since his stint in state government, not only envisaging it becoming an Asian super-hub in the next decade but directly borrowing the example of Israel and its leading edge dominance of the regional economy through a highly-educated workforce and available of high living standards in its cities. In addition to the accolades heaped on his administration, both internally and increasingly externally, Kamal is feted by diplomats and international urban policymakers as a young and confident city leader. While his fans speak of his charisma and dynamism, Kamal also uses his guile and political strategy to make the office of nazim work as the driving force of Karachi’s urban development. As nazim (mayor) of Karachi City District Government (CDGK), Kamal is one of only 10 heads of government of upper tier cities in Pakistan and heads its largest metropolitan area, notable for its comparatively cosmopolitan population and linguistic communities. He is Karachi’s second nazim since the reform of the city government in 2001. In March 2009 Mayor Kamal travelled to the US to sign a sister city (twin city) agreement between Karachi and Houston. At the signing ceremony, Houston Mayor Bill White described his Karachi colleague as a man who was striving to make Karachi a modern and well developed mega city which was admired internationally.